Revision of the fixings permitted under BS 8415 have failed in a pull force test in the required soil conditions to pass the recommended 150kg. This could represent an unacceptable health and safety risk and undermine the credibility of BS 8415. When tested by the method given in this annex, vertical components of monuments, the highest part of which is greater than or equal to 625mm above ground level, shall withstand the specified horizontal force without substrate failure or sudden brittle collapse. The load test must be carried out by an independent test house under the supervision of a chartered or incorporated civil or structural engineer. A photographic record of the test should be made and included in the test report. The chartered or incorporated engineer must sign off the completed test report. A horizontal force is applied to a monument fixing and anchor system and the results observed and recorded. 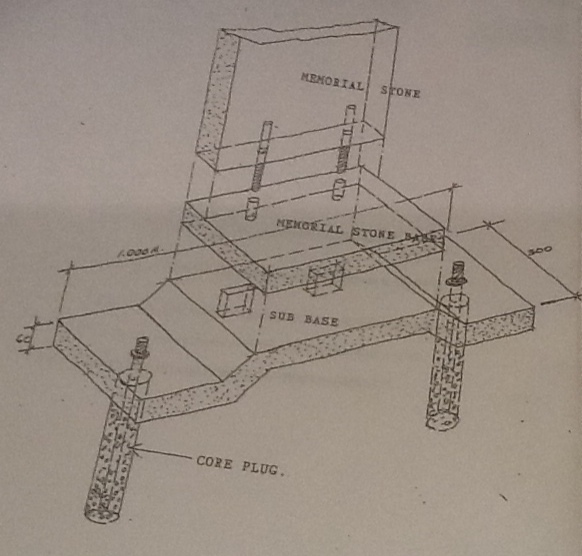 F.3.1 A test rig and reaction system which enables load to be applied at the required height and allows movement at the monument apex to be measured. F.3.2 A system for applying the required horizontal force. Suitable systems include a hydraulic jack or a lever ratchet system. F.3.3 a calibrated load gauge capable of measuring up to KN (200kg). Assemble a monument with its base (whilst under observation) using the fixing and anchor system to be tested. The system is to be installed in a purpose dug pit filled with medium/coarse sand. The pit is to be 1m x 1m in plan and at least 1m deep (the depth should be increased if necessary to ensure that no part of the system under test is placed in Virgin ground). The sand should have a maximum particle size of 5mm and is to be placed in 250mm deep layers, each layer to be tamped with at least a 5kg weight. The moisture content of the sand is to be measured with a moisture gauge. b). at a point not more than 1.5m above the base (or back kerb). Apply the force at a rate not exceeding 0.02 KN/s (2kg/s), up to a force of 1KN (100kg). Maintain this load whilst examining the monument for any failure as defined in 5.3.1. If failure is not observed, steadily increase the force to 1.5 KN (150kg) and sustain this force for 1 min. During this time examine the assembly for signs of failure. If a system failure is observed between loads of 1KN and 1.5KN it shall be in a progressive and controlled manner e.g by bending of ductile material (for example a steel dowel). Substrate failure or sudden brittle collapse shall be deemed unacceptable. The test should be repeated with the forced applied in the opposite direction. Considerations for proposed change to BS 8415. Stone-Safe would like some issues considered when reviewing the proposed changes to BS8415. The British standard does not contain any specific requirements regarding the foundation base size and weight when carrying out a pull force test and should become part of the standard. Enclosed drawing of accredited fixing system which incorporates all the proposed requirements of BS8415 and should be shown in Annex E. (This Annex contains typical design details for a monument).